Mike Dunne, an outstanding baseball pitcher with Limestone High School and Bradley University, made his major league debut this past June. In his first game he was on the mound for the Pittsburgh Pirates and gave a good account of himself against the Mets All-Star Dwight Gooden. He then went on to finish with a 13-6 record and an ERA of 3.03, second in the National League to Nolan Ryan. Mike was named Rookie Pitcher of the Year by the Sporting News and was runner-up to San Diego catcher Benito Santiago as National League Rookie of the Year. He had a great day against his former ball club, the St. Louis Cardinals, beating them 3-1 on a 4-hitter, and then later repeated his control over the Cardinals by a 1-0 victory. On May 1, 1987, Dunne was a throw-in to finalize a trade by the St. Louis Cardinals to obtain Tony Pena from Pittsburgh which also got Andy Van Slyke and Mike LaValliere. 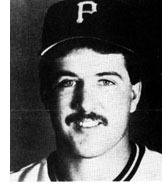 Mike's performance in Vancouver, a Pittsburgh farm team, where he achieved a league leading ERA of 1.76, brought him to the majors quickly. And the Cardinals soon found out that Dunne was substantially more than a throw-in. While at Bradley, Mike became the 15th Peoria area athlete to represent the country in the Olympic Games, and won a silver medal. He also was selected on the AllAmerican team, and was the number one choice of the St. Louis Cardinals in the draft. As a member of the Cardinal organization, he spent 1985 in Little Rock and had a 4-9 record with a team 25 games below 500. His ERA of 3.08 was fourth best in the league. In 1986 he advanced to Triple A Louisville, Kentucky where he led the league in innings pitched, had an ERA tenth best in the league and a record of 9-12.